Lucy's Retired Surfers Bar and Restaurant is another venue on the list of places to get its start in New Orleans and then open another location in Baton Rouge. This most certainly is not a problem though, as Lucy's has brought a new type of establishment downtown. 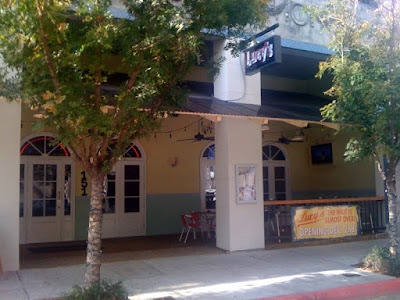 Sitting right next to the Roux House on Third Street, Lucy's took over the space previously occupied by D'Agastino's. With a complete renovation, Lucy's now serves lunch and dinner thoughout the day and stays open for bar patrons at night. 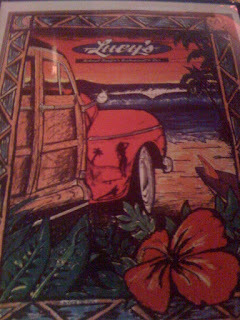 I went to Lucy's twice during the week that it opened to check out the menu and the overall vibe of their new location. It definitely has a surfer theme with surf boards hanging on the wall and surfing videos playing on the TVs that are scattered around. On my first visit I sat at the bar (unfortunately it was my lunch break so there was no drinking this time) and ordered the chips and salsa appetizer while I waited for Eric to meet me. 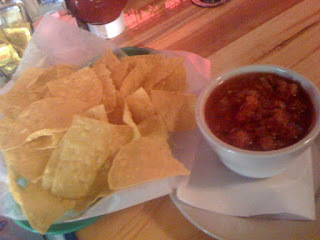 The salsa was made made fresh and the tortilla chips were home-fried, which is always a good way to start a meal. The salsa contained fresh chunks of tomato and a lovely mixture of spices that I thoroughly enjoyed. Lucy's keeps three different hot sauces on the table for their customers who want to add a little extra kick to their meals. 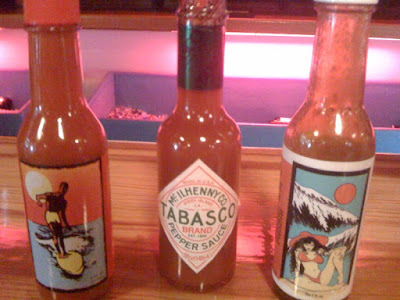 They have Tabasco which is a staple in Louisiana and all over the world that needs no introduction. The other two sauces are produced exclusively for Lucy's. One is a vinegar based hot sauce which is very similar to other Louisiana hot sauces, but the other is a truly unique blend of sweet and spice that uses molasses and various chilis. It took a couple tastes to decide if I liked it or not, but the end I really did! 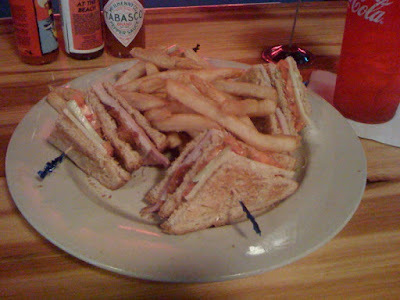 Lucy's club sandwich came double-decked with turkey, ham, and bacon as the protiens which were complimented nicely by cheese, tomatoes, and cucumbers. The cucumbers added a twist to the sandwich that I enjoyed, though it certainly did not blow me away. The Havanna Tacos grabbed my attention on the first visit that I made to Lucy's and I most certainly did not regret that decision. 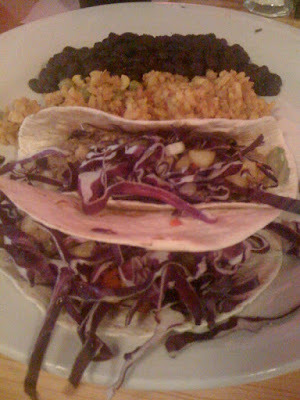 I ordered my tacos on soft flour tortillas and they came stuffed with juicy cuban-style pulled pork, grilled pineapple relish, and some crisp red cabbage. Along side the tacos sat a generous portion of black beans and rice. The tacos offered a good twist on latin food that were certainly not pure tex-mex like most places in Baton Rouge that offer tacos. I'm going to make sure to go back Lucy's during the evening on Tuesdays because, like any good taco stand that wants to get close to my heart, they have a Taco Tuesday special that deals out $1 tacos from 4-10 pm. How you can you go wrong with that? !